The boom and arm have been re-designed according to the latest stress analysis criteria, to reduce stress points while maintaining weight optimization to ensure the best lifting performance. New high strength casting parts with joined hinge flanges reduce stress and increase durability. The undercarriage has been re-designed and re-shaped to facilitate the welding process, enhancing the reliability of the fabricated structures. The One-Side-Slope lower frame design reduces the time needed to clean the undercarriage. The thickness of the structural plates has been increased, especially in those parts where a high level of protection is required for components. 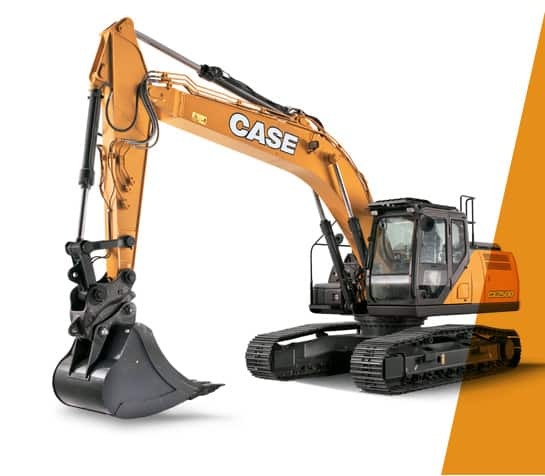 True to CASE's enviable reputation for reliability and durability, the D-Series delivers leading design solutions and manufacturing quality. Wide choice of arm solutions, including the heavy- duty arm with reinforcement plate and bars on the bottom side. Standard Heavy-Duty boom and arm on the CX370D. Auto Power boost automatically increases hydraulic pressure according to the operation's demands. Idle functions: the Auto Idle function lowers engine rpm after 5 seconds of lever inactivity whatever the throttle position, while the Idle Shutdown function shuts the engine down after a pre-setted time. Both are manually switchable. CASE adds a variable geometry turbo charger to increase exhaust gas recirculation efficiency without losing power. New ergonomically designed highback seat with air -suspension for excellent comfort. Non slip-plates and top hood cover are supported by 2 gas pistons and secured by 2 mechanical stops when open. A wide platform (up to 60 cm) on top of the engine compartment to work safely on the engine box. Radiator and cooler cores mounted side by side for easy access for cleaning and more efficient cooling. Dust-proof net in front of the radiators is accessible from the ground.